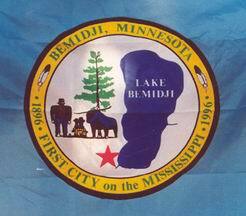 No description is given on the city website, and only the center of the flag is visible - a blue field, with the city seal, displaying a map of Lake Bemidji, a pine tree and three figures, and a red star marking the location of the city. Around the central disk is a yellow ring with the words BEMIDJI MINNESOTA separated from 1896 - FIRST CITY on the MISSISSIPPI - 1996 by feathers. The "three figures" are the famous statues in Bemidji of Paul Bunyan, the mythical lumberjack, and Babe, his blue ox. (The center "figure" may be a sign.) See here: http://en.wikipedia.org/wiki/Image:Paul_Bunyan_and_Babe_statues_Bemidji_Minnesota_crop.JPG. Paul Bunyan is well-known throughout the US, but seems to have begun as a legend in the Minnesota area, and the most famous representation of him is in Bemidji.